A refreshing summer breeze greeted us as on the day we visited Hinoki Publishing in Kanda, Tokyo. Hinoki Publishing, together with Wanyashoten and Nohgaku Shorin, specializes in publishing and selling utai bon, “chant books,” and other books on Noh, and has been in business since the Edo era. The fifth-generation president of Hinoki Publishing, Tsunemasa Hinoki, is young and mild-mannered, with the earnest air of a banker. This is because before taking over management of the publishing house, he actually worked at a bank. Having spent part of his life away from the world of Noh is precisely why he feels so strongly about having people unfamiliar with Noh enjoy it. It is from this idea that he has cultivated the seeds of understanding through new activities to broaden understanding about the world of Noh. still remain at Hinoki Publishing. What kind of publisher is Hinoki Publishing? One of our largest roles is publishing chant books for the heads of the Kanze and Kongoh schools. We have a long history, beginning with Chobei Yamamoto in Kyoto, who published a chant book for the Kanze School in the early Edo era. The oldest material we have dates from 1659, around 350 years ago. Chobei Yamamoto (Yamacho) was also a neighbor of our ancestors who worked as moneychangers. We were connected in that way too, I suppose. During the Keio years, our family bought the Yamacho printing rights and became the publisher. During this time we also bought the rights to many other chant books and commentaries from other publishers. 150 years later, I am the fifth generation to run Hinoki Publishing. We began publishing chant books for the Kongoh School in 1898. At the time, our main office was in Kyoto, and due to our friendship with Kinnosuke Kongo of that area, we received a printing by Yahei Yamagishi from Osaka in 1882. With the beginning of the Showa era, we built a continuous relationship with the head of the school, Ukyō Kongoh, to publish his chant books, the new versions of which we still currently publish. What kind of books besides chant books do you publish? In addition to reference materials on utai, we sell cassette tapes, CDs, DVDs, and other media with recordings of actual singing and performances. Lately we have been working on our offering of introductory materials on Noh and Kyōgen as well as reference materials on Nohgaku. In addition to manga and other illustrated books, we offer the lyrics as well as a series of books with modern Japanese translations and more understandable programs, in the interest of creating more new Noh fans. You were born into the business of Noh. Did you always enjoy it? Actually, it was quite the opposite. I was born in this kind of household, and through elementary school, my grandfather took me to study Noh dance. But as I grew older school became more and more fun and I began to make friends. I couldn’t get into Noh, and I began to drift away from it. But since it was our family business, I had opportunities to see performances of Noh and look at chant books when I would come to the office. But I was never serious about learning or studying Noh. What was your impression of Noh at the time? I couldn’t figure out what was interesting about Noh. While I didn’t think it was unapproachable, I guess I struggled with what people usually see as the problems with Noh, such as the performances being too long or there not being enough movement. And since I was born into a Noh family, I couldn’t exactly fall sleep at the Noh theatre. I couldn’t just enjoy Noh for what it was at the time. You led a life away from Noh, right? I studied economics at university and found a job at a bank after graduating. Because my mother was an only child, I knew that I would be the one to take over the business, and I knew that I would have to start helping out at the office soon enough. But I wasn’t very realistic about it, and continued to run away from Noh, not studying or practicing it. But I eventually ran out of excuses, and after eight years quit my job at the bank and began helping out in 1999. It will soon be ten years since I joined the family business, and I believe that certain things become clear only after having run away from them. For those who aren’t familiar with Noh, its seemingly unapproachable or incomprehensible nature may be like this. People that are very familiar with Noh have a hard time understanding this. While I lack some expertise about Noh, I know the parts of Noh that regular people struggle with. That’s why I’m able to show people what is interesting about Noh, and the reason why I’m working so hard on introducing and popularizing it. What are the challenges you face as president? As a specialist publisher on Nohgaku, we have a limited market and have to produce a certain level of material to please Nohgaku fans. 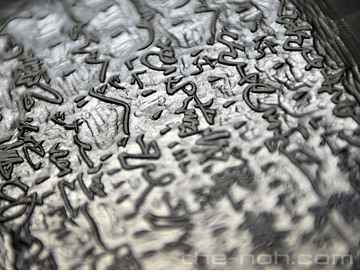 Because of this we need experts on Noh to write books for us, as well as time and funding. But since we don’t produce large quantities of books, the prices are correspondingly high. For very high-price items, we can expect only a very limited number of readers, though we would like to attract as many readers as we can while keeping our budget at a certain level. However, we also have to produce a quality product – this can be difficult. Could you tell us a little more about the current limited market? Previously, chant books and reference books formed the core of our business. Looking back, we were supported by the people who practiced the song and dance of Noh. We met their needs through the publication of chant books. However, within the past several dozen years the number of people practicing Noh has become extremely limited. From 1955 to 1965 there were lots of people studying Noh, and the printing of chant books reached its peak, however we now publish maybe one tenth of the chant books published at that time. The practice of Noh has just become unpopular. But there are still many performances. Compared to the period from the latter half of the Showa era to the bubble economy of the Heisei era, when the amount of performances increased greatly, we have seen some decrease, but it is still a large number compared to the number of people who practice Noh. When the season begins, Takigi Noh is performed in many different areas. The number of public performances of Kyōgen is also increasing. In that way, the kensho audience may be beginning to support Noh. However, personally I believe that without the support of those who practice Noh, it will be difficult for it to continue to develop. What is the role of a publisher specialising in Nohgaku in a situation like this? We have to think about how to contribute to a type of Noh that is supported by the fans. First what is needed are reference materials that will help people enjoy Noh the first time they see it. With that as a basis of understanding, we would like to lead fans to more books that will help them understand different interesting and fun parts of Noh. Nozomu Hayashi, who is also interviewed in this series, is currently writing a book that explains Noh in everyday terms. Lastly, we would like to have the people who practice the song and dance of Noh become involved in deepening the understanding of Noh. In reality, when one begins to practice Noh, the songs become interesting, and the background behind the songs one has practiced becomes more visible on stage. This was certainly true in my case. I understood the depth of Noh and that there were many different ways of enjoying it. I would like to produce products and literature that help others do the same. The modern-translation series that I mentioned before is one good example of this desire. It’s hard to watch Noh without being interested in it. While some people are interested in the artistic aspects of Noh, some are interested in the costumes and masks. Some are intrigued by the music of the hayashi, the sound of the flutes and drums. In my case, I wanted to know what was being said. I thought that I would find the performance more interesting if I just knew the meaning of the lyrics, so that’s where I decided to begin. I would like to know at least 100 songs. I hope that this series could help people develop an interest in Noh by becoming a standard reference read before attending a performance. What are you doing to get people practicing Noh? 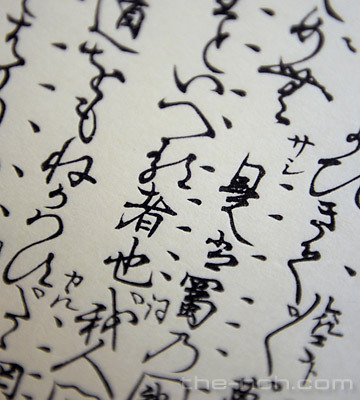 There are good and bad overall aspects of Japanese-style forms of practice, but I think that there are certainly a lot of traditions and unspoken rules. There are clear systems for English conversation classes or cooking classes, such as set monthly costs and hourly rates. However with Japanese-style forms of practice, it is often unclear where teachers or classrooms can be found and how many additional fees on top of monthly fees will be required. There is just a lot that is initially unclear. Once one gets used to this it no longer seems inconvenient or unclear, but it does contribute to a very expensive and unapproachable image. That is why our firm is trying to help beginners not to be confounded by the traditions of Noh through our support of the “Becoming Familiar with Noh” workshop, in which anyone can easily experience the practice of Kanze School Noh. The workshops are run in different locations throughout Tokyo by two to four teachers with introductory song and dance lectures held twice monthly. The workshops are run by the teachers and students, with our firm volunteering to offer support with applications, administrative tasks and arranging venues. We make the required costs, time and venues clear from the start, hold a year-end gathering and have set schedules. After the introductory classes, those who wish to learn more may select the teacher they prefer and continue their studies. As all of the teachers are core members of their school, we feel that we have quite a sophisticated program. As the specifics are made clear from the beginning, the program is very approachable, and we receive a lot of interest. We have an even mix of male and female participants, with the majority in their 50’s, 60’s and 70’s. Lately we are seeing more men in their 60’s who are starting to have more free time away from their jobs. While we have some people who are very familiar with Noh, many of our participants are beginners. Our yearly gathering is quite lively, with many of our female participants coming dressed in kimonos. Tell us more about your efforts to popularize Nohgaku aside from publishing. We help with the administration and details of Takigi Noh performances at Kanda Myoujin, located near us. During my grandfather’s time, together with Wanyashoten and Nohgaku Shorin, we would help with the training of the three roles (waki kata, hayashi kata, Kyōgen kata), through the Nohgaku Training Workshop (formerly the Nohgaku Three Roles Training Workshop). These activities, which began in 1954, were important in training the talent necessary to support the post-war world of Noh and continue nearly thirty years later as part of the program of the National Noh Theatre. We cannot separate ourselves from Noh. Our continued support of Noh connects to the continuation and expansion of our business. Activities aside from publishing, such as increasing the number of people studying Noh and other activities to support Noh are essential to us. What is important to someone young and inexperienced such as me in being involved with Noh is to try to not diverge from the essence of Noh. For example, we would like to have continuous performances of Noh in the future, something we haven’t been able to do thus far. But, is this consistent with the unique, once-in-a-lifetime essence of Noh? In trying to preserve this essence, we must consider what needs to be changed, as well as what must be preserved, and while this can be difficult, it is something I want to continue to keep in mind. What would you like to tell those people not familiar with Noh? a fun guidebook for Noh beginners. There are many people who have never seen Noh. This is the case even among friends of mine. Outside of the world of Noh, while people may be familiar with the word, they don’t know exactly what it is. Some people can not even distinguish Noh and Kabuki, much less Noh and Nohgaku. These are the type of people I definitely want to see Noh at least once. While this is something we need to work on, I honestly feel that schools should create opportunities for children to learn about traditional arts such as Noh in the classroom. In the age of globalization, as internationalization progresses, it becomes even more important to teach children about the culture of their own country. I think we need to place effort into explaining to the outside world about the music, arts and spiritual culture of Japan. The masks, costumes, and stages of Noh – preserving Noh means preserving the Japanese culture in which is rooted. 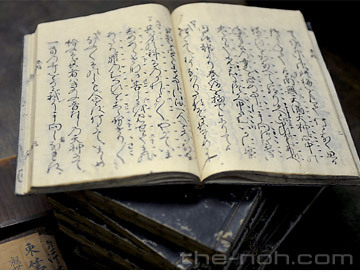 Even a single chant book, created from materials such as Japanese paper and silk thread using techniques such as Japanese bookbinding, is supported by many different artisans. 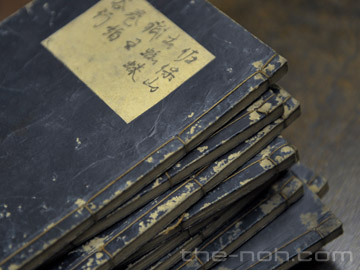 If Noh were to fall into decline, chant books would stop being sold, and the artisans that support the art through their passionate handiwork would be out of business. Actual sales of chant books are decreasing and Noh is already on the brink of dying out. I want to create as much awareness about this reality as possible. Noh is not only about continuing to hold performances. Becoming passionate about Noh is a way of supporting the foundation of Japanese culture as a whole. We are doing our best to make available a variety of written materials, products and information to do so. 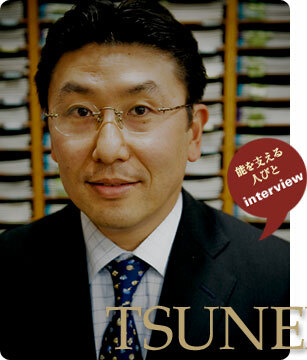 Born in 1968 in Tokyo, Tsunemasa Hinoki joined The Mitsubishi Bank (now The Bank of Tokyo-Mitsubishi UFJ) in 1992 after graduating from Aoyama Gakuin University. He left his position there in 1999 to join Hinoki Publishing, becoming its president in 2001. Mr. Hinoki also serves as a member of the board of trustees at Kanze-Bunko Foundation and Kongoh Nohgakudou Foundation.